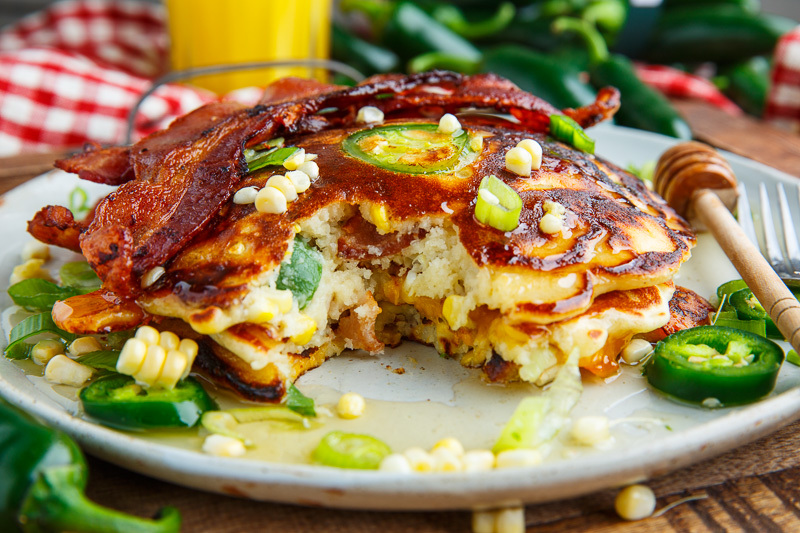 Sweet corn pancakes with spicy jalapeno and pockets of melee cheddar cheese; the perfect sweet and savoury treat for breakfast lunch or dinner! 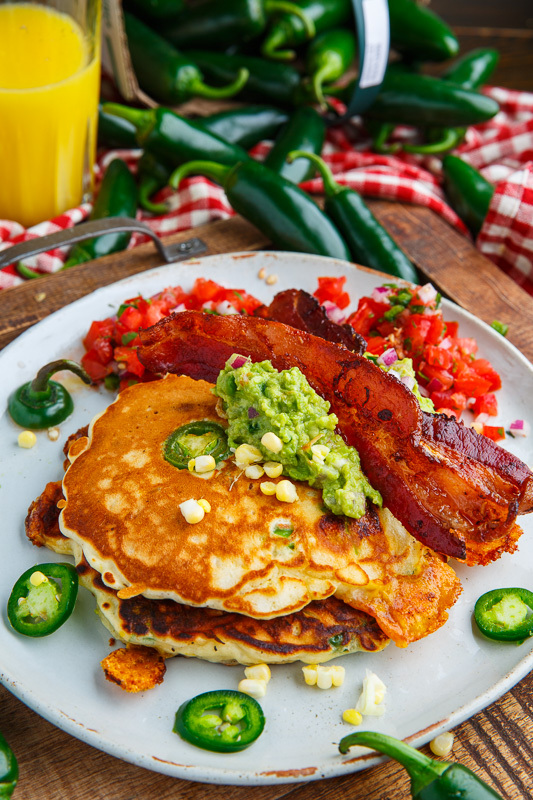 I have really been enjoying a lot of pancakes recently and my next batch, and possibly my favourite recipe, are these tasty jalapeno and cheddar corn pancakes! 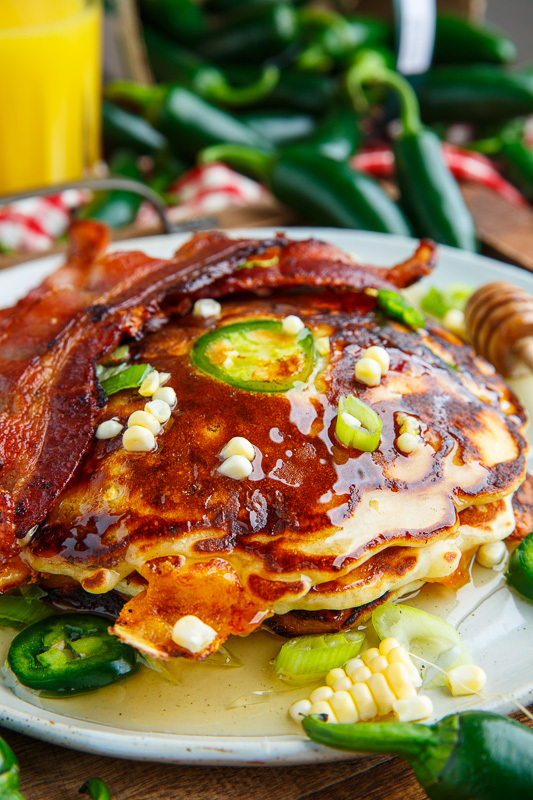 These pancakes were inspired by the flavours of jalapeno poppers! 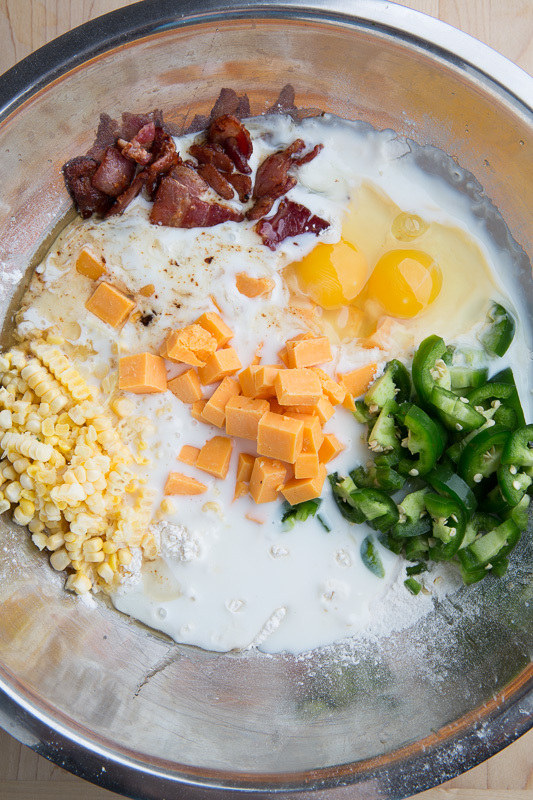 Of course spicy jalapenos are the primary ingredient and I like to balance things out with the addition of sweet corn and honey. Next up is the cheese aspect of the poppers that I add with large cubes of cheddar cheese which melts in pockets in the pancakes that just burst into your mouth when you bite into them, that is if they don’t melt and ooze out into the pan when cooked. 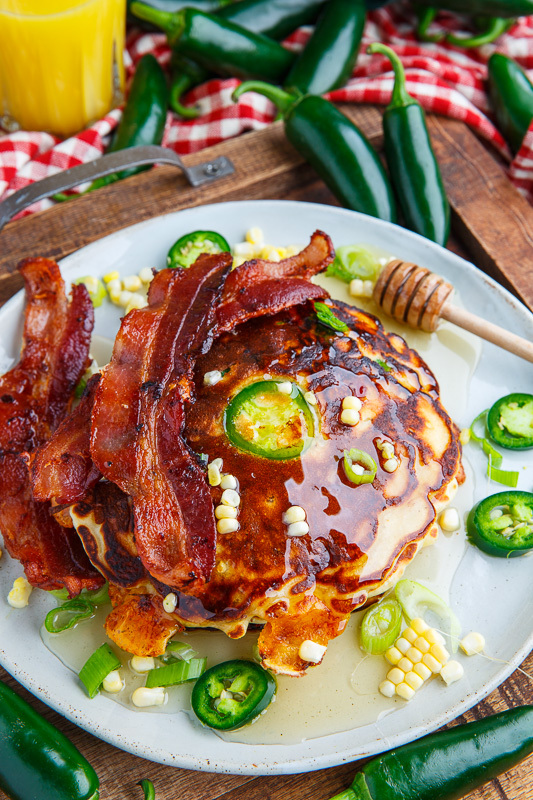 I also enjoy a bacon wrapped version of jalapeno poppers so I like to add crispy cooked bacon to the pancakes, in addition to serving it with extra strips; you can never have too much bacon! 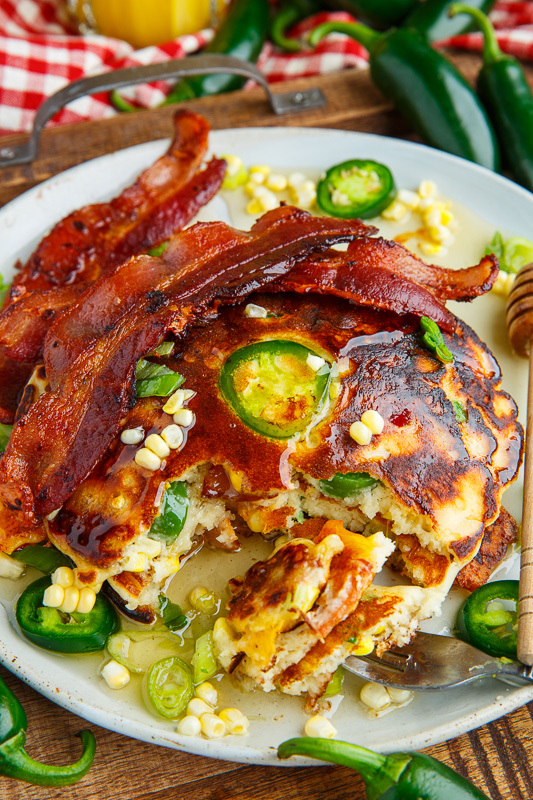 These jalapeno and cheddar corn pancakes with bacon (aka jalapeno popper pancakes) are an amazing combination of sweet and savoury that is simply magical! Serve them with savoury toppings like guacamole and pico de gallo! 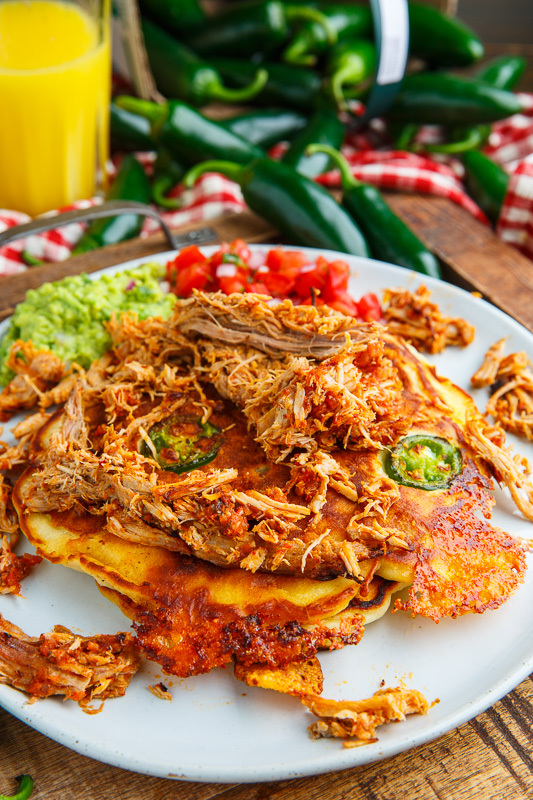 It’s also good topped with carnitas! Lightly mix everything before heating a pan over medium heat, optionally with a bit of oil or butter, add 1/4 to 1/3 cup batter and cook until bubbles start to form on the surface, about 1-2 minutes, before flipping and cooking until the bottom is lightly golden brown, about 1-2 minutes. Repeat until done. Option: Add cubed cream cheese to the batter! I'll go seedless with the peppers and add the corn to the batter which will also be a corn mealbased batter. At least for the first batch. Kennapop3: Replacing some flour with for meal is Good! Lots of things I love here in a single recipe. Will absolutely give this one a go whenever I can, it sounds and looks delicious.